In business, first impressions matter. For some companies, the first touchpoint with customers and partners comes in the form of printed materials such as brochures, signs, flyers or posters. Recognizing that, HP has been developing and fine-tuning printers and print technology to meet the demands of small and medium-sized businesses who need an affordable all-in-one printer that can tackle projects of all sizes. Today, HP is announcing the OfficeJet Pro 7740, a wide-format printer that not only produces high-quality printed materials at a lower cost per page but give companies the features they need to push the limits of their designs. For example, the OfficeJet Pro 7740 can produce a volume number of borderless, double-sided materials in the 11×17 wide format, thanks to a large paper input capacity and high-yield ink cartridges. 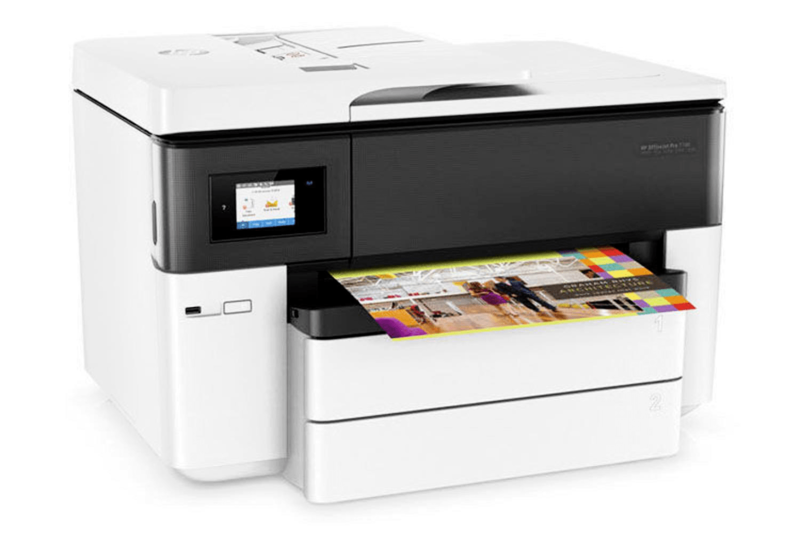 At the same time, it’s a functioning office device that provides single-pass two-sided scanning, copying and faxing. And its 35-page auto document feed (ADF) accommodates both letter (A4) and legal-size (21.6 x 35.6 cm) documents. Understanding that today’s workforce is often mobile and tap a variety of devices to stay productive, the printer taps into wireless and wired networks and can accept print job requests from smartphones, tablets and wirelessly-connected PCs. Users can print from iPhones® and iPads® using AirPrint®, as well as devices running Android™, Windows® 8/10, or Google Chrome™ operating systems – and generally without any extra set-up or the installation of an app, which makes it great for guests or visitors who need to print, too. Finally, the OfficeJet pro 7740 also comes with HP JetAdvantage Private Print, a cloud-based offering that allows sensitive documents to be stored in a queue and released only when the user is authenticated at the printer itself. This keeps such documents from falling into the wrong hands by colleagues who share the same printer and may accidentally pick up each other’s printouts.